Blog | Page 7 of 8 | A-1 Cleaning Service, LLC. Cleaning tips for places that you may often times forget. Sometimes when cleaning gets tedious, we tend to cut corners to shorten the time it takes us to get our chores done. I know I need to take some of the below cleaning tips more seriously in my own home. Since it’s flu season right now, it’s especially important to get the high-contact areas; this will make sure to keep your home germ free and flu free, too. Its FLU SEASON, are your knobs germ free? Door knobs are probably the dirtiest thing we can forget to clean. Countless people come into contact with them every day, leaving behind the oils from their hands, their germs, and who knows what else. Simply take a clorox wipe and wipe down your doorknobs daily to keep the grime at bay. Lamp shades always seem to attract a massive amount of dust and pet hair, a simple and effective way to clean dirty lampshades are by running a lint roller over the shade. For more soiled plastic, fabric, or stitched shades, go ahead and fill up a tub with cool, mildly soapy, water, swirl, then rinse clean. For paper and shades with glue water might not be a good idea for obvious reasons, your best bet is to vacuum them frequently with your dusting/upholstery attachment. Use water and a very mild degreaser-if you absolutely must use chemicals to clean, although I’d only suggest water for LIVE house plants. Of course, wipe away all crumbs, then fill up a microwaveable safe bowl with about 1-2 cups of water, mixed with lemon juice (or a freshly cut lemon half, squeezed into the bowl) microwave until the water boils and let it sit for a few minutes to let the steam really penetrate, the steam will loosen any yucky dried on particles and the lemon will leave a nice smell, naturally. Wipe down the interior with a damp cloth, and wash the revolving tray like any normal dish. Wipe down the outside after spraying with your choice of kitchen surface cleaner. Also, don’t forget to microwave the rag or sponge you used for 45 seconds to kill any nasty bacteria it may have picked up. As you sweep, take your broom and run it along the edges of your baseboard to knock off any dust that may have accumulated, then go over it with a Lysol or Clorox wipe, or your own favorite cleaning solution, to make them sparkly clean. Here are some cleaning tips for a few different types of screens. Each type is a little different, but they should all be handled with care. If you’re not sure about something, refer to your owners manual for further cleaning tips and instructions. LCD– Follow the steps for a plasma tv, but make sure to dry the surface quickly with a separate dry cloth, make sure your screen is dry before turning it on and never push on the screen, it can permanently damage your screen, and that would be a bummer. Projection- Projection televisions that have a special plastic screen over the actual television screen can be cleaned with a damp soft cloth. The screens can be damaged by paper towels and heavy duty cleaners. Projection televisions without a shielding screen will need special consideration, so refer to your owners manual. Conventional- While older televisions can usually be cleaned with glass cleaner and a paper towel, some newer models still have special coatings on the surface that could be scratched and damaged. If your not sure about your television, the best thing to do is use a soft dampened cloth. Books can get especially dusty, especially fast. Make sure your books are tightly closed, weather it be because you are holding it, or because they are packed on a shelf. Take your dusting/upholstery extension (the kind with bristles) on your vacuum and go to town. While your guests are waiting to be let in, they’re staring at your front door, think, is your covered with grime from seasons past? You can simply spray the door down with a hose, but for the more adventurous, an alternative solution–give the front door a makeover, painting it in a playful, fun color! We like RED! Since flu season is in full swing, and not letting up any time soon, go ahead and take your clorox wipe and attack any and all surfaces that come into contact with germs! To help get your mind rolling here are some suggestions, but make sure you’re wiping down anything that gets handled a lot, such as: the phone, keyboards and mice, doorknobs iPods and tablets, faucets, coffee pot handles, the steering wheel and gear shifts in your car, etc. Hopefully these cleaning tips will help you keep your home germ free this spring. And, as always, you can’t forget the most important thing–your carpets! Fresh, clean, carpets are inviting, and clean carpets say ‘I care about my home’! Call us today to schedule your carpet STEAM cleaning! How To Clean Your Dishwasher and More! Read These Steps to Clean Your Dishwasher and Prolong It’s Life! Dishwashers are extremely convenient kitchen tools to have around. It takes the chore out of washing your dirty dishes, leaving you more time to do other activities. Still, did you know that you dishwasher gets dirtier even as it’s cleaning your dishes? It seems strange, with it running hot water and soap frequently, but that actually doesn’t clean your dishwasher. Read these steps to take care of bacteria and get your dirty dishwasher clean again. First, take out the bottom rack so you an examine the drain area for chunks of food that can plug the drain. It’s very important that you keep the drains clear, as clogging can cause damage to the pump and anything hard can also scratch your dishes. You would be surprised at the list of things dishwasher repairmen find in the drains—bones, chipped pieces of glass, crab shells, and even bits of gravel! Second, fill a cup with white vinegar and set it on the top rack of your dishwasher. Set it to the highest temperature available then run the dishwasher through a cycle. For this process, the only thing that should be in the dishwasher is that one cup. With the cycle running, the vinegar will help clean your dishwasher by removing any loose grime, sanatizing your dishwasher, and helping to remove any musty odors. Third, after sanitizing with vinegar, fill a cup with baking soda then sprinkle that around the bottom of the dishwasher. Run it through a short but complete cycle on the highest temperature. The baking soda will clean your dishwasher by freshing the smell inside and brighten the insides by removing stains. 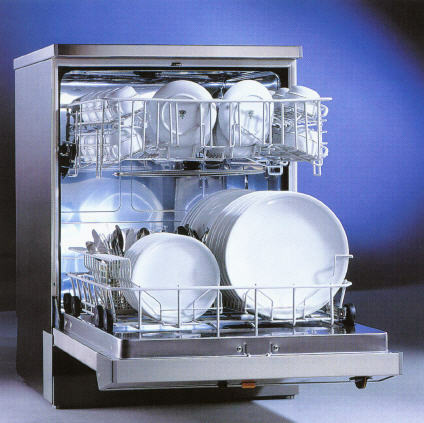 Here are some tips for preventing build-up in your dishwasher and prolonging that visit from the mechanic. Making sure you clean your dishwasher regularly will ensure a long life for your appliance. 1. Run your garbage disposal before every dishwashing. Since the dishwasher drains to the same pipe as your sink, make sure you keep the drain clear to prevent clogging. 2. Run the sink until the water gets hot. Running the water before starting the dishwasher will get you cleaner dishes because the cycle will start out hot. If you’re worried about wasting all that water, you could always put a bucket under the faucet and use it to water your plants. 3. Set your water to start at the right temperature. Check the thermostat on your water heater. Water that is cooler than 120F (50C) won’t clean well enough, but water that is any hotter may scald. 4. Don’t pack your dishes too tightly. It’s good to run full loads to conserve energy and water, but if you pack your dishes too tight you may not be getting them adequately clean. 5. Don’t prewash you dishes before putting them in your dishwasher. Consider this for a second, detergent requires grease to do it’s job. If you wash all the grease before cleaning them in the dishwasher, then the detergent will start to foam up during the cycle, which is bad for your dishwasher. Now that you have gone through all that trouble to clean you dishwasher, have some fun with these tips and tricks the next time you feel like experimenting. 1. Wash hats! Baseball caps usually don’t hold up in the washer, but they do hold their shape fairly well in the dishwasher. Just run your hats through the rinse cycle once, but don’t use soap. 2. Steam salmon! Wrap your salmon well with tin foil and your favorite marinade. Be sure to seal it well. Run a full cycle, drying process included (don’t add soap though, of course). This will steam your salmon perfectly; it will be moist and it won’t leave that fishy smell in your kitchen. 3. Clean vacuum attachments! Make sure to shake all the loose dust and hair into the garbage first so you don’t have to clean your dishwasher out again. Put the attachments in the silverware basket, then run a cycle. 4. Wash your kids toys! Small plastic toys like Hot Wheels or action figures can go into the cutlery closure. You could also put them in a mesh bag or the plastic basket. This can be done for pet toys, too! 5. Wash your potatoes! Instead of having to wash them individually by hand, set them on the top rack and run them through the rinse cycle. 6. Make yourself a warming oven! If you are expecting company and don’t have enough ovens to keep all your hard-cooked dishes warm, try putting some in the dishwasher on the dry cycle (make sure you don’t set it to wash), and you have yourself a makeshift warming oven. 7. Wash gardening tools! Garden and household tools can go into the dishwasher if they have plastic handles. If there’s any chance that they have chemicals on them, make sure to wash them separate from your dishes. 8. Wash your light fixtures! Wash your light fixtures on a very gentle setting. This is much easier than dusting them. 9. Wash thongs, wellies, and crocs! Run a wash cycle with a small amount of baking soda to clean any plastic footwear you have. 10. Wash combs or hairbrushes! Combs and hairbrushes made of plastic material are dishwasher safe, and can go in the cutlery tray to be washed. Don’t use wood or boar-bristle brushes, as that can damage your brush. Protect the drain by removing all the hair from the hairbrushes first. NOTE: For most of these items, you should wash them separately from your regular dishes. Be clean and have fun! If you liked this post, you should check out some of our other posts like our Guide for Spring Cleaning or how to Clean Oven Grease Naturally. Because hydrogen peroxide is basically the same chemical makeup as water (with an extra oxygen atom), it breaks down quickly and harmlessly in oxygen and water. Your body’s white blood cells naturally produce H2O2 to fight bacteria/infections. Vegetables and Fruit naturally produce H2O2. This is why it is so healthy to eat fresh produce, among other things. It is found in large doses in a mother’s first milk, and when fed to the baby it boosts their immune system. The different uses for hydrogen peroxide are endless. Here are a couple of ideas you can utilize the next time you grab a bottle of this miracle cleaner. 1. Clean sponges of bacteria. Sponges get gross after a couple weeks of use, so use hydrogen peroxide to revitalize your sponges. Soak them in a mixture of half H2O2 and half warm water for ten minutes, then rinse thoroughly. 2. Wash your fruit and vegetables naturally. Add ¼ cup to a sink full of cold water, then rinse thoroughly afterwards. 3. Add a couple of ounces of H2O2 to the detergent before turning on your dishwasher for a sanitizing boost. You can also make your dish soap more sanitizing by adding 2 oz of 3 percent hydrogen peroxide to the bottle. 4. Clean your kitchen appliances with hydrogen peroxide. It’s great for cleaning places that you store and cook food because hydrogen peroxide is non-toxic. 5. Remove gunk from pots/pans by combining hydrogen peroxide with baking soda until you get a paste. Rub this onto the dirty dish and let it sit for a while. After enough time has passed (it really depends on how baked-on the gunk was), grab a sponge and some warm water and the gunk should wipe right off. 6. Clean your countertop and cutting boards. Let the hydrogen peroxide bubble for a few minutes, then scrub and rinse like normal. 7. Wipe your kids’ lunch boxes/bags with hydrogen peroxide to sanitize. 8. Just like using lemon juice on apples, you can use hydrogen peroxide on your leftover salads to keep them from wilting. Use a mixture of one tbsp of H2O2 to half a cup of water and spritz your salad to keep it looking and tasting fresh. 9. Freshen your breath by using hydrogen peroxide as a mouthwash. It will kill the bacteria that causes halitosis. 10. Between uses, soak your toothbrush in hydrogen peroxide to keep it clean. This will also prevent the transfer of germs. This is an extremely tip to use if your family has a cold or the flu. 11. Clean your toilet bowl. Pour ½ cup of hydrogen peroxide into the toilet, let stand for twenty minutes, then scrub and flush. 12. Whiten the grout in your bathtub/shower. First dry the surface well, then spray it with hydrogen peroxide. Let it sit for a while, then scrub the grout with an old toothbrush. This process may have to be repeated a few times. 13. Remove mildew and soap scum from shower curtains with hydrogen peroxide. For plastic curtains, wipe down with H2O2 and then rinse. For cloth curtains, put them in the wash with a bath towel, then add your regular detergent plus one cup of hydrogen peroxide to the rinse cycle. 14. You can kill any bacteria/viruses in your shower or tub with hydrogen peroxide. This is what the bubbling is doing! 15. Use baking soda and H2O2 to make a paste that’s good for brushing your teeth. Mix baking soda and hydrogen peroxide until you get a paste, then brush. This helps kill bacteria, so it’s good for the first stages of gingivitis. If you mix this solution with salt, hydrogen peroxide will work as a whitening toothpaste as well. 16. According to some physical therapists, adding ½ a bottle of H2O2 to your bath water can help to detoxift the body. Some are still skeptical about this claim, but bathing has never hurt and the addition of hydrogen peroxide will leave both you and your tub squeaky clean. 17. Hydrogen peroxide can remove yellowing from lace curtains or tablecloths. Fill your sink with cold water and 2 cups of three percent H2O2. Soak for at least an hour, then rince in cold water and air dry. 18. You can use hydrogen peroxide to pre-treat stains on clothing, curtains, tablecloths, etc. Soak the stain in 3% H2O2 for a little bit before tossing it in the laundry. You could also add one cup of hydrogen peroxide to your whites to boost brightness. It works just as well as the green bleach alternative. 19. Get rid of the musty smell in your bath towels. Combine ½ cup of vinegar and ½ cup of hydrogen peroxide and soak the towels for 15 minutes. Then wash normally. 20. Clean humidifiers and steamers by adding one pint of hydrogen peroxide to a gallon of water, then running them. 21. Control the fungi in your aquarium. Don’t worry, this won’t hurt the fish any. Use sparingly in this case. 22. Dab some H2O2 onto acne or pimples to clear your skin. 23. Add natural highlights to your hair using hydrogen peroxide. Spray a solution of half water and half H2O2 on wet hair to create subtle, natural highlights. 24. Ward off fungus that grows on your plants. Next time you spritz your plants, add a little hydrogen peroxide to the water to help out your plants. 25. Hydrogen peroxide helps improve the health of new sprout seeds. Use 3 percent H2O2 once a day to spritz the seed whenever you remoisten. You can also use hydrogen peroxide diluted in water to improve your plant’s root system. 26. Clean your children’s toys and play area. 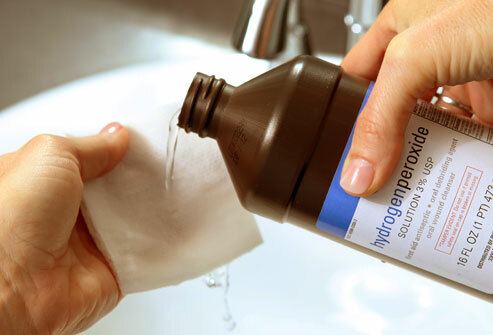 Hydrogen peroxide is safe to use around kids and people with respiratory problems, because it isn’t a lung irritant. Spray toys, doorknobs, toyboxes, baby gates, anything your kid comes into contact with on a regular basis. 27. Help make foot fungus go away. Spray a mixture of half H2O2 and half water on your feet (especially the toes), every evening and let it dry. Alternatively, you could soak your feet in this solution to help soften calluses or disinfect wounds. 28. 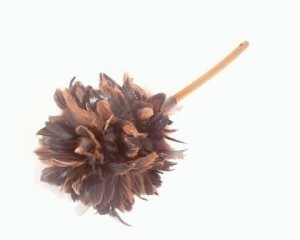 Remove ear wax with 3 percent hydrogen peroxide and olive or almond oil. Add a few drops of oil, then H2O2. After a few minutes, tilt your head to the side to remove the wax and the solution. 29. Brighten your floors. Combine a gallon of water with ½ cup of hydrogen peroxide then scrub your floors. Because H2O2 is so mild, it is safe for all floor types, and you won’t have to rinse. 30. De-skunkify yourself with 1 qt of three percent H2O2, 1 tsp Dawn Dish Soap, ¼ cup of baking soda, and 2 quarts of warm water. Wash yourself with this to make the skunk smell go away. *BONUS* Follow this link to find out how to Use Hydrogen Peroxide to Treat Urine! If you liked this post, check out some of our other helpful cleaning posts like Carpet Stain Removal Tips or our Spring Cleaning Guide. Great Cleaning Tips Using Original BLUE Dawn Dish Soap! Blue Dawn Dish Soap is no longer limited to just washing your dirty dishes. While it works amazingly well for cleaning pans, pots, glass, tupperware, or any other diningware you can think of, it’s everything else it can clean that makes it so useful to have around the home. In fact, Blue Dawn is almost as versatile as baking soda when it comes to cleaning products! Here are a few tips that will make cleaning your home that much easier. It seems that most stains people tend to get are oil based stains; this is one of the hardest kind of stains to get out. Some examples of oil based products that commonly end up on clothes/furniture is lipstick, butter, motor or cooking oil, grease, and certain pen inks. Dawn dish soap can take care of these stains for you! All you have to do when faced with an oily stain is apply the soap directly to the stain and scrub the spot with a toothbrush until the oil stain is removed. For clothes, launder as you normally would after this. Getting rid of ants is easy with Dawn Dish Soap. Spray a mixture of water and Dawn directly onto countertops, floors, sinks, or wherever the ants seem to be. This will leave behind a residue that ants refuse to walk across. It is also safe for kids and pets, so you don’t have to worry about any harsh chemicals. If you spray the solution directly on an ant, Dawn will penetrate their exoskeleton and kill them on contact. This also works for wasps and cockroaches. Clean your windows like a pro with Blue Dawn! Fill a spray bottle with only three drops of Dawn to a gallon of water, then clean your windows the same as you would with any other window cleaner. This will leave your windows shiny and streak-free! A lot of concern with using chemicals is whether it is biodegradable or not. There are many chemical degreasers and solvents that could get rid of outside stains, but they aren’t really good for the environment. Blue Dawn, though, is and it can take care of stains in your driveway. First, use the kitty litter method to pick up all the extra oils then use warm water and Dawn Dish Soap to further remove oils from your pavement with great effectiveness. Finish the job by using a little elbow grease and a scrub broom on the spot, and your driveway will soon by stain free! Were you aware that Dawn can kill fleas on contact? It is not as expensive as dog/cat shampoos, and safe for the babies who are too small to be given medicine for their flea problems. For bathing larger animals, use 1 tsp per gallon of water and half a tsp for smaller animals. Make sure to rinse THOROUGHLY or the leftover residue will dry and cause mild skin irritation for your furry friend. To help add moisture to their fur and skin, finish the bath with a few drops of conditioner. *BONUS* To completely get rid of fleas, make sure to clean any furniture your pet may use often as well as the carpets. Wash your pet beds in warm water mixed with Dawn soap. To clean carpet or upholstery, fill a 16oz spray bottle with water and 1 tsp of Dawn Dish Soap. Shake well to mix them together, then spray the solution onto whatever needs cleaned. Let this sit for 15 minutes, then wipe down with a damp towel and vacuum (for the carpet). Instead of calling a plumber, try Dawn Dish Soap to get rid of clogs in your drain. To make the solution boil 3-4 tbsp of Dawn in a pot full of water. Pour this mixture down the clogged sink drain, but be careful not to burn yourself! This will break down most sink clogs because Dawn can break down grease. If it’s not just grease blocking pipes and there’s still a blockage then you can get Tucson plumbers to help get rid of it. Dawn is a lifesaver for cleaning tools in your workshed because of how tough it is on grease. Right after finishing your automotive projects, soak your tools in Dawn and water to remove all the grime and oils from them. Many mechanics also claim that Dawn can keep the tools from rusting. Find a puncture in any tire by mixing Dawn Dish Soap and water and brushing the soapy mixture on the leaky tire. The exact location will be easy to find because it will bubble in that spot. You can try this same method with anything that holds air to find a hole. Prevent fogging of your lenses by rubbing a drip of Dawn Dish Soap on eyeglasses and the wipe them off. This will clean them and leave a film that prevents fogging. Mix 1 tbsp of Dawn Dish Soap, 1 tbsp of borax, and ¼ cup of water, soak your dirty combs and brushes in the mixture. Rinse well and let dry. Before starting a paint job, rub straight Dawn Dish Soap over your hands and arms, wherever you think paint might end up, and let dry. When you’re finished painting, any paint that may have gotten on your will wash right off your skin. You can use Dawn to remove soot that has settled or hardened onto the external bricks of your fireplace by combining equal parts Dawn Dish Soap and Morton Salt. Add enough water to this mixture to make a cream, then rub the mixture into the brick with a cloth. Wait 10 minutes, then scrub the dried solution with a stiff brush and wipe clean with a wet sponge. Clean up your grill for those Sunday dinners out on the deck. First place the grease-coated grill in a trash bag that can be sealed. Using a half cup of Dawn Dish Soap to a gallon of water, pour the soapy mixture over the rack that’s inside the bag, seal it, and let it sit overnight. The next day, scrub the grill with a wire brush and rinse. This is a giant bubble recipe used in bubble makers at many museums for children. Gently stir a mixture of half a cup of Ultra Dawn, half a gallon of warm water, and 1 tbsp of glycerin (available at any drug store). Skim the foam off the top, because too much foam keeps bubbles from forming. Then just dip bubble wand and begin blowing. Have fun!! Sort of at least—You can use Dawn to do your part in saving wildlife. By supporting Dawn products, you are also supporting efforts to clean oil spills and protect wildlife across the globe. Dawn Dish Soap is the preferred wildlife cleaner after an oil spill. According to the “International Bird Rescue Research Center,” Dawn is the most effective at removing grease while not harming the skin of birds. It is also biodegradable and doesn’t contain phosphates. TO HELP SAVE WILDLIFE THIS YEAR!! Over the past year, Dawn donated a total of $500,000 ($250,000 each) to two wildlife organizations—The International Bird Rescue and The Marine Mammal Center (TMMC)— so when you’re using these tips just remember, you’re supporting a company that contributes back in a great way! For more great cleaning tips, see some of our other posts like our tips for Removing Grass Stains or Must Haves for Your Cleaning Kit! Does Your Cat Keep Leaving Urine Stains on the Carpet? Ever wonder why your cat always seems to leave urine stains on the carpet? Do you find yourself asking, why doesn’t my kitty at least have their accidents on the tile? Dianda over at Cats & Co writes an interesting blog shedding light on as to why our furry friends prefer the carpet. 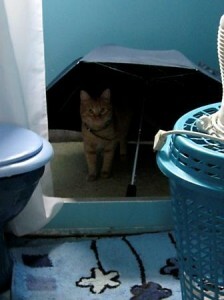 Check it out at Cats vs. Carpets. Most of the issues people have when it come to urine stains stem from the places that were left untreated until they became noticeable (either by discoloration or odor). Cats often times mark their territory in places other than their litter box, whether it be in the middle of your living room or in some discrete corner you can’t even see. Before long, the microbes in the urine break down and release ammonia; this is the chemical most responsible for that cat pee smell. Even worse, at this stage mercaptan is also secreted. This chemical is the one that makes you want to run away whenever you see a skunk. If your cat keeps making urine stains on your floor, try buying an new litter box for your furry friend. I have read that you should get a new box every six months, because cats have more sensitive noses than humans, and as such can smell some of the left over odors in their cat boxes that we cannot. And remember, if your pet has left urine stains that you just can’t seem to get up, then call us, A-1 Cleaning Service, LLC, to enzyme and steam clean those stubborn stains away! Why is STEAM carpet cleaning the superior, safest, and preferred method of carpet cleaning, and how does it compare to other methods? “Hot Water Extraction”, or “Steam Cleaning”, the Extraction cleaning procedures are what nearly all carpet manufacturers in addition to carpet fiber manufacturers recommend as cleaning method for soiled floor coverings. 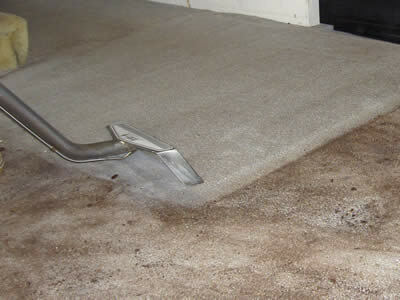 This method is frequently called “steam” cleaning due to the fine spray of water used to force dirt out of the carpet which is sucked up by the vacuum slot immediately in front of the spray. This is the only cleaning method classified as “deep cleaning”. All the others are considered “light surface cleaning” because they are incapable of removing soil deep in the pile. Other methods leave large amounts of cleaning agent in the carpet after cleaning. The process consists of spraying a solution of water and detergent into the carpet pile and recovering the water and soil with a powerful vacuum into a holding tank. This is done from our truck-mounted unit outside the home with only the hose and floor tool brought inside. Truck-mounted systems usually are more powerful than portable units and do a much better cleaning job and get the carpet dry more quickly. Normally between 4 and 8 hours. 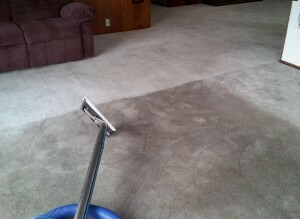 It all depends on what type of carpet you have, the humidity, air flow, and level of soiling. What do I need to do before the technician arrives at my house? Please have all furniture (couches, tables, chairs, beds, ottomans, etc.) moved off of the flooring you wish to have cleaned. Our technician will only help move furnite within reason. Are there any risks to my health? The truck-mounted system is preferred because the dirty air and humidity are exhausted outside rather than re-circulated around the house. Furthermore, if you happen to suffer from indoor allergens, getting your carpets professionally steam-cleaned can actually help benefit allergy sufferers. More often than not, thing such as dust, dust mites, pet dander and other allergy-prone factors that get trapped in carpets, especially if their thick or plus. Unfortunately, most vacuum or consumer-brand carpet cleaners don’t manage to get down far enough down to where allergens may be lurking, which is where steam cleaning can truly help. While products like raved-over handheld vacuums can be valuable in keeping carpets relatively clean, there are some dirts that can only be prevented through professional carpet steam cleaning. How does steam clean differ from shampooing my carpets? The theory in the shampoo method is to generate a lot of foam in the carpet, allow this foam to dry, have the resulting residue attract the soil, and vacuum up the residue and soil the next day. The problem is that they dry to a soft, sticky residue which will cause re-soiling. Because of the re-soiling problem, carpet shampoos will frequently also has an anti-re-soiling additive such as a resin to reduce this re-soiling tendency. Foam shampoos are actually very poor detergents and simply bury the dirt, they frequently also contain high levels of optical brighteners which take invisible ultraviolet light and convert it to visible light, thus making the carpet appear cleaner and brighter than it really is, for a while. It will eventually give the carpet a yellow cast and the yellow cannot be removed. The Rotary Shampoo method can damage the carpet, especially cut pile (which is what most residential carpet is). How does steam clean differ from ‘dry cleaning’ or ‘carbonated cleaning’? This method is sometimes called “chem-dry”, “bonnet method”, or “dry cleaning”, which is a misnomer, since water is used. This method for carpet maintenance consists of the use of a rotary or oscillating brush adapted with a stiff brush or drive block designed to drive wet, damp or dry pads. The carpet can be sprayed with the cleaning solution and/or the pads can be soaked in the cleaning solution and squeezed lightly before placing the pad under the driving brush. Sometimes, carbonated water is used to (in theory) give better soil suspension and bring down the pH. Check with your carpet manufacturer because many leading carpet mills recommend against this method of cleaning. Make sure you review your warrenty information, as bonnet method may void the warrenty of your carpet. Can you get the pet odors out of my carpet? Pet odor is a very common problem that could be much more complex than on first impression. Pet urine can easily soak through the backing of the carpet into the padding underneath. In more severe cases the urine can penetrate into the sub-floor beneath the padding. This creates a problem that is multi-layered. The urine also provides for the growth of bacteria. This in turn contributes to a worsening of the odor problem and can contribute to permanent color loss of the carpet fiber. To eliminate this problem, the urine must be removed or neutralized from each of the layers affected. If the contamination is limited to only the face yarn of the carpet then the cleaning itself may effectively remove the odor. In more severe cases a urine neutralizer may be applied. In the most severe cases, replacement of the carpet padding, treatment of the under-side of the carpet and the sub-floor may be required. 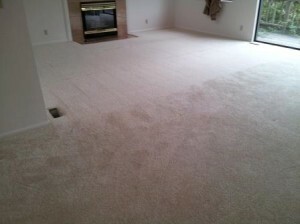 Even replacement of the carpet, however, can not guarantee complete removal of the odor. So while we can try, it is not guarenteed, it all depends on the degree to which your carpet is contaminated. One thing my grandma repeated to me a lot was that having a clean house helps you sleep better. But she wasn’t just talking about dusting and picking up your clothes off the bedroom floor, she also meant the carpets. What does having clean carpets in your home have to do with sleeping, you might ask. Well, this blog would like to share some information with you that you may not have thought about. Allergies & Asthma: When allergy season is in, people often stay inside. Unfortunately, though, your carpet traps all these airborne particles that are let into the house. The good news is that fewer particles are disturbed when walking on carpets compared to other flooring, like hardwood or linoleum. The bad news though, is that while some allergens are stirred up, others settle into the fibers of your carpeting. Microscopic dust mites secrete proteins when burrowed deep into your carpet, and these proteins trigger symptons in 30% of people prone to allergens. While vacuuming frequently helps, it won’t get rid of the imbedded particles, pet stains, and dust like a professional cleaning would. Mold: In the rainy seasons, liquids from leaky ceilings, pet accidents, high humidity, and spills can build up in the padding of your carpet. This moisture is the perfect environment for mold growth. Your carpet is also prone to mold when you use an at home shampooer if your carpet fibers don’t dry quickly or adequately enough. Carpet pads are the most likely place for mold to hide, as it is sandwiched between the carpet fibers and the subflooring, so it gets the least amount of air flow. It’s very unhealthy to let odors, dust, pet stains, mold, or any other particles built up in your carpet to settle, so learn to identify your mold problem before it becomes dangerous to you and your family. Then call a professional steam cleaner to help remove particles, neutralize odors, and decontaminate urine. When cleaning your home, remember grandma’s words and don’t forget to add carpet steam cleaning to your wish list for a clean house. Determine how often you should get your carpets cleaned with a few simple questions. A question I’m commonly asked when talking about carpet cleaning is “how often?” Many manufacturers recommend that you get your carpets cleaned every 12-18 months. Places with high traffic, however, should consider getting them cleaned every 6 months. Here are a few helpful questions to ask yourself when you’re deciding if you carpets need cleaned. Do you have any pets? How many? We all love our pets, but we also know how messy they can be at times. Pets shed their hair and have oils on their skin that can get into your carpeting. They don’t know anything about using a napkin when eating or wiping their feet of mud when coming into the house. When you have a lot of pets, you will need to clean pet stains from your carpets more often. How often do you vacuum? Vacuuming twice a week is what most manufacturers suggest. Just remember that the better care you give your carpet between professional cleanings, the less often you’ll need to get your carpets cleaned. Do you or your family suffer from allergies? A clean carpet can drastically reduce the allergens in the air, leaving it fresh smelling and making it easier to breathe. Depending on where you live, you may need to get your carpets cleaned 2-3 times year. How many people live in the house? Does anyone wear shoes inside? This should come as no surprise, but walking around inside with your shoes on gets your carpets dirty a lot faster. More foot traffic also develops wear patterns on soiled carpet. Wearing socks or indoor-only slippers is the best way to preserve your carpets, as going barefoot can leave the oils on your skin in your carpet fiber. What does your warranty require? Many people aren’t aware that your manufacturer requires this to keep your warranty form being voided. You can see by just these few questions that the base question of “how often” can vary greatly between homes. As for the actual cleaning process, most carpet manufacturers recommend hot water extraction aka steam cleaning over a chemical process. This is because chemical or “dry” based cleaning uses large amounts of chemicals to make your carpet look nice. Not only does it leave chemical residue in your carpet that is not safe for kids or pets, but it doesn’t even remove pollutants or allergens. With “steam cleaning,” the temperature and pressure of the water do most of the work, with little chemical used per gallon of water. The chemicals that are used are mild and biodegradable detergents that help to dissolve the dirt in the water, which is extracted before it can make its way down into the padding. If you liked this post, check out some of our other blog posts like Worst Carpet Messes for Parents or Feeling Better With Cleaner Carpets. Make cleaning a breeze with these essential cleaning tools. Folks often confess that their cleaning arsenol consists of supplies they bought, used once, and stored in the attic for the next garage sale. They have separate cleaners for toilets, showers, baths, carpet stains, clothing stains, 5 window cleaners that all streak, all the cleaning tools ever advertised and none of this stuff works, Let’s widdle this down to the necessities and take the confusion and expense out of cleaning. The following list is geared to serve a typical home. 1) Start with a divided tote tray found at hardware stores. Do not use cleaning aprons unless you like trips to the doctor to straighten your neck due to the weight. Or worse email me asking what to do after bumping a sprayer and the cleaner ruined your antique coffee table. 2) A large plastic cup to hold a plastic scraper, stiff bristled toothbrush, non-scratch pad or other small cleaning tools. 3) A plastic container with holes in the lid filled with baking soda. You can also use a clean, plastic parmesan cheese shaker. 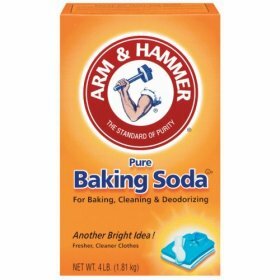 Use baking soda to scrub sinks, tubs and shower floors and toilets. 4) A gallon of vinegar. Use to remove hard water stains in the sink and add a bit to your diluted concentrated cleaners. Vinegar boosts the cleaning ability of a cleaner. If your concentrated cleaner calls for one ounce per quart of water add ¼ cup of vinegar and use ¾ of an ounce of cleaner. 5) Toilet bowl brush – do not use the ones with the metal ring as the metal part scratches. 7) Two clean spray bottles for dilution – three if you use my Wood Care. It’s the only wood cleaner and conditioner on the market that can be diluted. 8) A concentrated eco-friendly all-purpose cleaner like my CleanEz. 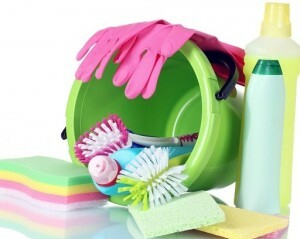 They clean most counter tops, appliances, toilets, showers, tubs, clothing and carpet stains. No you don’t need separate products to do these chores. Concentrated cleaners save you a bundle of money so look for concentrates. 9) A streak free, concentrated bottle of glass cleaner. I carry a good one called Benya. Make certain it does not contain acids or ammonia so it’s safe for Corian, granite and marble countertops. Glass cleaners are especially useful for frameless glass showers (Glass Shower Direct let you design showers online) and large windows. This is because they can leave you with a streak-free shine. 10) Color coded towels. I use blue terry towels for the bathroom, white for the kitchen and a green one for the floor. Then baby diaper cloths for dusting and lint free towels for windows. Windows and glass are the only safe surface for microfiber. Buy the expensive microfiber cloths. The cheap ones leave lint and smear. • Note: I use color coded towels because they are faster. You’ll dig for hours looking for the right towel to clean the bathrooms, or kitchen or dust. Don’t waste the time. Color code your towels for fast cleaning. 11) A good mop. Of course I’m a bit prejudice but I feel the one I manufacture is faster and outlasts anything on the market. Plus it does cobwebs, walls, windows and dries off cars, Rvs and boats. Again do not use microfiber mops unless you like replacing or refinishing flooring. Lastly always refill your bottles when you finish cleaning. That way they are ready to go for spills or quick clean up.